Dairy Worker Safety Training: This 2-hr. on-dairy training provides individualized audio-video dairy safety training using mobile-learning technologies (iPads) covering safety topics across the dairy farm. Included are topics such as working with large animals, large equipment, chemicals, electricity, silage safety, and many others. Workers who have completed the training will receive a certificate of training, while the dairy operation will receive a letter stating which employees were trained when and on what topics. The training is based on the successful video series developed by NMSU Dairy Extension available on YouTube - Dairy Safety Training. Safe Animal Handling Training: This 3-hr. on-dairy training provides individualized audio-video training using mobile-learning technologies (iPads) for dairy employees who work with dairy animals. The video portion of the training focuses on understanding how to safely work and interact with large herding animals based on natural behaviors, instincts and characteristics, and how to anticipate the interaction between humans and animals based on that understanding. In a second part of the training we will demonstrate with a group of cows, how cows perceive humans and how they may likely respond to pressure. This comprehension is essential for safely and easily moving, sorting and handling (milking, breeding, treating) of dairy animals of any age, hereby avoiding stress responses from the animals. Training of small groups of employees is preferred. Workers who have completed the training will receive a certificate of training, while the dairy operation will receive a letter stating which employees were trained when and on what topics. 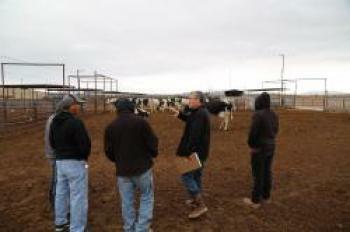 The training is based on the Dairy Stockmanship Video provided by NMPF's FARM Animal Care 3.0 program. Drug Residue Prevention Training: These 4-hr. classroom style training sessions are developed for dairy employees. The first training provides milkers with a basic understanding of lactation physiology and mastitis in dairy cows. The training is complemented with a lab session utilizing udder tissue to instruct udder anatomy and physiology. The second training provides animal caretakers with a basic understanding of how to conduct a postpartum clinical exam, how to observe, recognize and understand nutritional aspects of postpartum diseases and how to properly handle medication on the dairy. The training includes lab sessions examining mammary glands and injection site lesions. Employees will receive a certificate of training. Both sessions can be instructed in both English and Spanish..
Hoof Trimming Classes: 3-day on-dairy practical training for dairy employees as step I for Dr. Jan Shearer's Master Hoof Care Program.